I've seen Slothrust many times over the years and they have always sounded too spot on to be playing such dingy venues (the Trash Bar, really?) It's like "Hey, these guys are actually good, what are they doing here?" As I recall they're all music school grads and thus far more competent than the competition at that level. 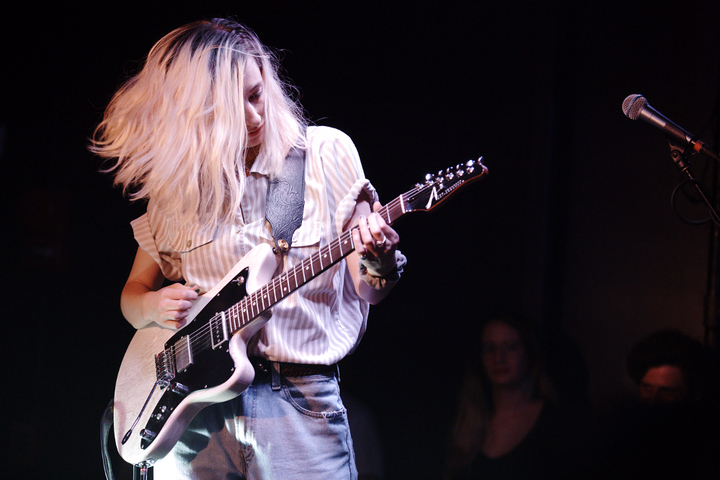 Fortunately for my sense of propriety Slothrust have kind of broken out in the last year or so and are now playing to hundreds of fans at lovely venues like the Rock and Roll Hotel. Even better, or maybe worse, they seem to have developed a cult following in DC. People have been singing along to their songs for a few years now and there seem to be more of these amateur vocalists at every show. One guy was wearing a Britney Spears T-shirt with multiple Britneys on it which reminded me of this (though it actually has more to do with this). Slothrust seem to have tapped into something and it's weird, man. Personally I just like their music because it's catchy while also having with some serious oomph and clever lyrics on top of that. It's like a delicious musical layer cake of some sort.